Rosehip oil's potent natural actives make it highly effective for scars and stretch marks and other skin concerns including dehydrated and ageing skin. Our rosehip expertise ensures the finest quality oil with minimum 80% essential fatty acids (omega 3 and 6) and fatty acid (omega 9) content. Independent clinical studies show Certified Organic Rosehip Oil helps improve the appearance of scars, stretchmarks, fine lines and wrinkles. Massage 2-3 drops into cleansed skin on face, neck and/or body. May be used alone or in conjunction with your favourite Trilogy moisturising product. 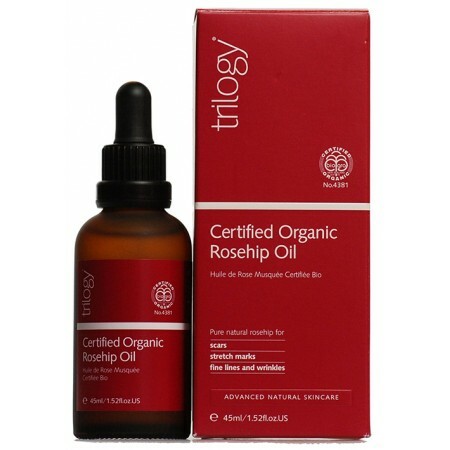 When applying to young scars, Certified Organic Rosehip Oil should only be used once the wound has healed and should never be applied to broken skin. To Ensure Compatibility We Recommend Patch Testing Before First Use. Avoid Contact With Eyes. All Toiletry Products Have An Effect On The Environment. Always Use The Correct Amount For Maximum Efficiency And Minimum Environmental Impact.